Hybrid cloud management market survey by Ponemon Institute reveals key Enterprise IT priorities. A new survey carried out by Ponemon Institute on behalf of Embotics® examines the opportunities, challenges, costs and risks companies experience as they manage their public, private and hybrid cloud infrastructures and emerging application container environments. The research involved 632 individuals responsible for cloud management in their organizations. They are all knowledgeable about their organization’s use of virtualization and cloud infrastructure as well as the management and automation of the associated processes and technologies. DevOps enablement was stated by respondents as key to the success of today’s organizations. An important barrier to DevOps enablement was the ability to currently execute and deliver microservices or container-based enablement capabilities with accuracy. In order to manage DevOps enablement efficiently, emerging technology such as a hybrid cloud management platform can help organizations overcome barriers. 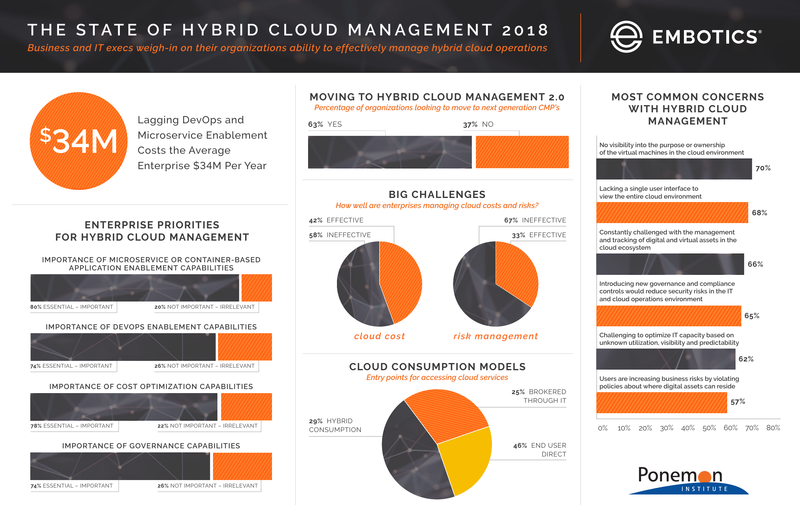 Download the full report, Enterprise Priorities for Hybrid Cloud Management, to see the full results of the survey, and how a hybrid cloud management 2.0 strategy provides additional value as organizations mature their virtualization, consolidation, automation and orchestration efforts.